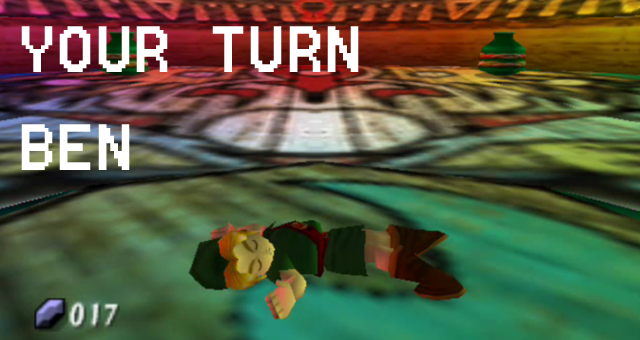 Several people remember the picture above from the original posting of the Haunted Majora’s Mask Cartridge, and it’s never been a more relevant picture than right at this moment. For those who have at least continued to check for any updates about one of the best arg’s to ever exist since it was stopped abruptly due to lack of funds, then you already know that it’s coming back…. for one grand finale. Everything that has happened in the story, happened at the site…. on youtube… has all been one grand precursor to a first to ever happen in an arg. “It’s Your Turn Ben” has real relevance, as we will be fighting this holiday season remove BEN from the plain of existence. The final installment includes an “actual game” that the internet can play, a physically existing videogame, that puts us into the BEN experience first hand. No longer will we be watching or hearing about what someone else is witnessing, we’ll get to witness it ourself. It’s not a traditional game either. You’ll have to find the small clues on the YouTube Channel and at the website to really progress, and the game can’t be completed without the internet uniting as one solitary force. This is a clear first for an arg game, and it is really setting up to be the most epic finale to anything internet related ever created. Thank you kindly Jad, and as always, thank you Majora’s Mask. BEN, I’m taking you out son. You can find out more at You Shouldn’t Have Done That.